A Colorado woman was arrested in western Kansas early this morning after allegedly holding her young son hostage. Around 3:20 a.m. Monday, Garden City police officers were dispatched to the 400 block of Davis Street for the report of a woman holding a knife to an infant’s throat. When they arrived, they found a woman standing in the driveway with a baby in her arms. Police say she was holding the blade of a pocket knife near the throat of her nine-month-old son. According to police, the woman yelled at officers and refused to release the child. Officers were eventually able to disarm her and take the baby away. The child was not injured. 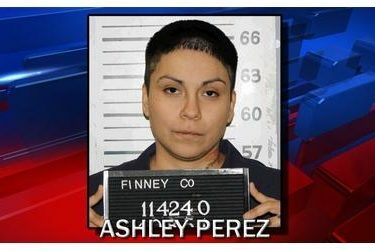 Ashley Perez, 25, of Colorado Springs was arrested and booked into the Finney County Jail on allegations of kidnapping, aggravated assault and endangering a child.